Scenic is the only river cruise line to design and build their SE Asia luxury river ships to meet European safety standards. The 68-guest Scenic Spirit on the Mekong and the 44-guest Scenic Aura for the Irrawaddy include key features such as marine paneling so noises do not penetrate to adjoining suites, compartmentalized fire zones, and custom built-in sprinkler systems throughout all public and private spaces. 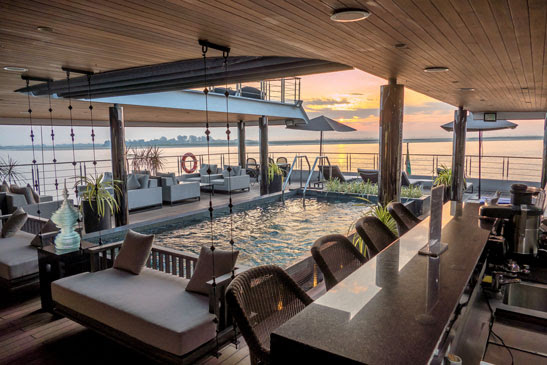 Accommodations onboard are all suites with walk out balconies (no porthole cabins) and are the most spacious and luxurious in SE Asia, offering sizes of up to 861 ft² on the Mekong and 735 ft² on the Irrawaddy. Guests enjoy pillow menus, scenic slumber beds, separate living and bedroom and bathrooms, and walk in wardrobes. Public areas include a pool, open air cinema, sun decks, spa, fitness room, sauna and steam room (Spirit), elevator (Spirit) and multiple dining options. Guests are also able to take in a stunning visual display of some of the most popular local artists of recent times, with a gallery of original artworks adorning the walls and hallways of both ships.